Neowin had the chance to play with the Samsung 700T, a 11.6" Windows 8 tablet with an Intel Core i5 1.6GHz dual-core processor, 4GB DDR3, 64GB SSD, WiFi, 3G, 1366 x 768 pixel resolution and a Bluetooth keyboard. The Samsung 700T tablet comes with a Intel i5 1.60Ghz dual-core processor, 4GB of DDR3 RAM, 64GB SSD, WiFi and 3G capabilities. The tablet uses a Samsung super PLS 1366x768 resolution inside of a 11.6” diagonal screen, weighing in at 909g and is only 12.9mm thick. 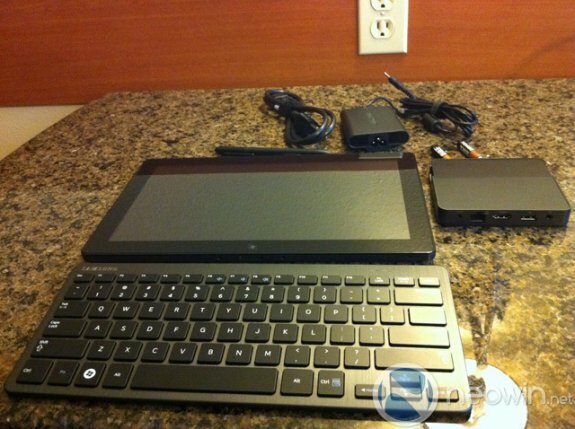 The tablet includes a Bluetooth keyboard, a pen/stylus, a docking station that contains a USB port, HDMI and Ethernet connection. The Windows 8 tablet includes a number of sensors for detecting movement and orientation.